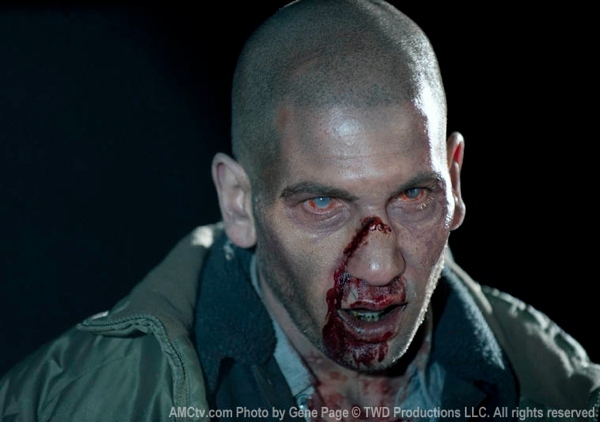 tilden talks...: Did Shane turn into a ZOMBIE? Shane turned into a zombie because the "disease" is airborne. That is what the doctor at the CDC whispered to Rick before they left; that they were all actually infected. If anyone dies without significant brain trauma(Shane & Randal), they will become a zombie. As for what Shane saw right before he became a zombie, I have no clue, I'll have to watch it again. I didn't remember the Doctor at the CDC telling Rick about the disease being airborne. I'll go back and check it out. And those flashes were what Shane saw before he zombie-fied, or was Rick saw as Shane zombie-fied? Well, now that I know this very important detail of the disease, it explains why people were getting kinda belligerent. I believe it happened when he was on the bus and cutting his hand and wiping it where the zombies were licking. Thanks everyone for your comments and information. This episode has stuck in my head since Sunday and there's a couple thoughts I can't get out of my head. One is the flashy images of Zombie after Rick killed Shane in the field. I just can't figure if the images were what Shane saw as he turned, or what Rick saw IN SHANE as Shane turned. The other is Darryl. He seems to be taking a more mature attitude to all the crap going on around him. He seems to be the most level headed and also the most affected by the disturbing events. He keeps his feelings quiet and to himself, but of all the people, he seems to be dealing with the situation the best of them all. Since we've determined that the virus is airborne, there is also the chance that some people will be immune. I think Darryl is one of them. He gets passionate, but he doesn't seem to lose his head.